Peerless Blowers PVI belt drive propeller fans are used as heavy duty industrial ventilating fans in steel mills, machine shops, packing plants, etc. or in duct installations where static pressure up to one inch is encountered. 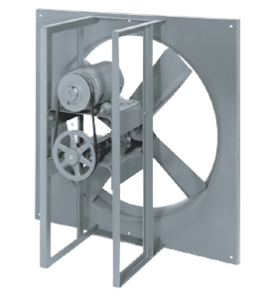 Peerless Blowers offers PVI propellers fans in 6 different sizes ranging from a 24″ to 60″ blade diameter. The CFM range is 5,890 to 63,445 (free air). The propeller fans are constructed with an integral motor-fan guard mounted on a steel panel. The propellers have aluminum bases with steel hubs. All fans come with totally enclosed motors.